Nadja - "Desire in Uneasiness"
Although often lumped in with drone/doom metal acts such as Sunn 0))) and Boris, the Toronto duo consisting of Aidan Baker and Leah Buckareff really transcend that genre with something that is quite different. 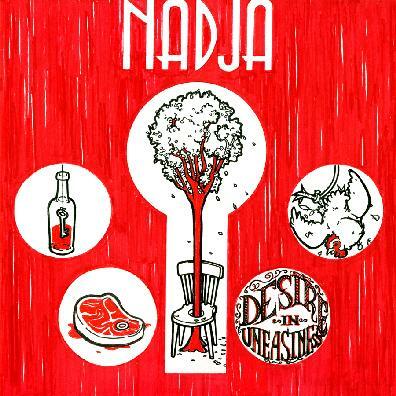 To nick a phrase from Julian Cope, we could call the music of Nadja "ambient metal". At its core, it is deeply heavy, with sonorous bass end drones and doomy, dirge-like grooves (the percussion, for the first time on a Nadja album, is played by a live drummer). But taking a cue from his lighter solo efforts, Baker adds a haze of faraway noise, which softens the edges, turning this from black metal into perhaps a shimmering white metal of sorts. Whereas other bands of the genre dwell on the drones, Najda dwells on the space created by the drones, and fills it with gauzy dreamscapes. The groove, slow as it may be, always keeps things moving along though, especially on longer tracks like the somewhat upbeat Sign-Expressions, and the throbbing Deterritorialization, which, with its pounding beat, could be disco music for zombies. Desire in Uneasiness should certainly please fans of more typical drone metal, but there is also something more going on here for those who don't quite get the genre. For people like that, Nadja is still worth checking out.